Late check out (after 11:00 and before 16:00) may result in a fee. The 40% deposit will be refunded up to 30 days prior arrival. If the reservation is cancelled inside 30 days of arrival, the deposit is non-refundable and in case of amendments during the last 30 days, no show or reduction of number of nights, a full charge for the entire stay will be incurred. The balance of the reservation cost will be taken 30 days prior arrival during the months of July and August and 15 days prior arrival from September to June. The Site offers information on our property. As used throughout the Site, the terms “Masseria Le Mandorle”, “the Company,” “our,” “we,” “us,” “our,” and other similar terms may refer to the Masseria Le Mandorle and it’s owner, Salentodamore SCARL. All of these terms are used for convenience only and are not intended as a precise designation of any of particular entity. All reservations must have a deposit via by a major credit card, or a deposit equal to 40% of the total accommodation fee received by the Castello di Ugento at point of booking to be confirmed. 30 days prior to arrival the remaining 60% of the total accommodation fee will be due. Any reservation made 30 days or fewer prior to guest’s expected arrival must be guaranteed by a valid credit card, or the reservation with a deposit of the full 100% value of the accommodation or it may be automatically be released. Masseria Le Mandorle: Ugento's hottest new 5 star boutique hotel, the contemporary-chic restauration of an antique farmhouse, with sleek designer pool, top sports facilities, including tennis, basketball, volleyball, five-aside football, a jacuzzi terrace, bicycles, and the Technogym-fitted fitness-room. The restaurant offers local and gourmet cuisine under the direction of Chef Odette Fada, House Chef of sister property Castello di Ugento. 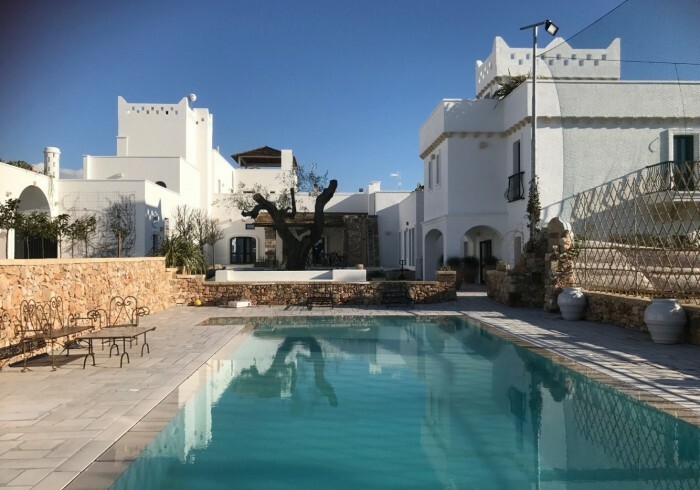 The property also includes a barbecue rooftop terrace with views of the gorgeous sunsets on the Ionian sea as well as a wood-burning pizza and bread oven in the main courtyard. All this near the most beautiful beaches of Salento, between Gallipoli and Leuca.